You will love the beautiful beaches, lagoons, lakes, outstanding National Parks, the gorgeous coastal walks and even the local penguins, not to mention the best views of the Harbour. No wonder the locals call the Northern Beaches in Sydney, God’s Country. 1. Fort Denison is a little island that fires cannons and used to be home to some of Sydney’s worst and most unfortunate convicts. 2. Kirribilli House, in stark contrast to Fort Denison, is a place of relative luxury and is currently used by the Prime Minister of Australia. 3. Admiralty House, Sydney residence of the Governor-General. 4. Cremorne Point and Cremorne Reserve. 7. The entrance to Middle Harbour. 8. Picturesque harbour-side beaches and coves. 9. Exclusive suburbs such as Mosman, Double Bay, Watsons Bay and the luxury water front homes of the rich and famous. 10. Taronga Zoo, Bradleys Head and the mast of HMAS Sydney. 11. Shark Island and the Rose Bay Seaplanes. 12. A passing Tall Ship with sails aloft (if you’re lucky). 13. Whales, Dolphins, Turtles but probably just seagulls although sightings do occur from the ferry. 14. Crème de la crème of the Harbour, Sydney Heads. Framed by towering North Head (ranked 5) to your left, and South Head (ranked 18) lighthouse to your right, this is the entrance to Sydney and the gateway to this great southern land. 15. 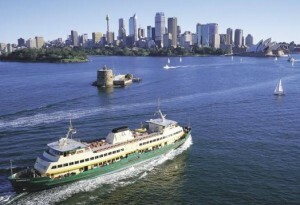 The approach into Manly often gets people off of their seats as they gaze upon the green peninsula that is North Head and Manly, Sydney’s seaside and harbourside village. And yes you’re right, the time does fly by whilst you look, admire, photograph and soak it all in. Having arrived in Manly, do you just jump on the ferry out again? No, Manly is one of our top attractions, ironically because it makes you feel like you aren’t in Sydney. Manly hosts a number of festivals and events each year. A few of them, like the Manly Jazz Festival, attract large crowds and international artists. If you would like to know what’s coming up, have a look at the festivals and events listed from the menu at the top of this page. For weekly updates subscribe to Sydney100’s free Newsletter. A visit to Manly is like a ‘holiday’ within a holiday. For starters, grab an ice cream from the wharf. It’s a bit of tradition for some and simply irresistible for others. The Corso is the name of the pedestrian mall which leads to the beach from Manly Wharf. Browse your way through the various shops enjoying the fountains as you go. At the end of the Corso you’ll find Steyne Road that runs North and South along the coast. From here, turn right and follow the path that runs alongside the beach. Whist you are still enjoying the views and smell of the sea you will first arrive at Fairy Bower and shortly after that, Shelly Beach. Either location is a good spot for a coffee stop or snack, but mostly just for the great scenery. A trip to Fairy Bower and Shelly Beach forms part of the top 5 things to do in Sydney. On the Harbourside of Manly, where the ferries come and go, you will find the Manly Art Gallery and Museum and the Manly Sea Life Sanctuary. The Manly Sea Life Sanctuary has seal shows, sharks, sting rays and a lot of fish. The larger internees are fed in the tank by divers at 11.30am on Monday, Wednesday and Friday. The Manly Sea Life Sanctuary opens at 10.00am and closes at 5.30pm. North Head provides some sensational panoramic views of the Harbour. North Head has an interesting history as a military base. Now North Head’s pristine heathland complete with ‘hanging swamp’ is preserved for your enjoyment. North Head is ranked 5 in the list of the top things to do in Sydney. The four kilometre (one hour) scenic coastal walk around Long Reef wins a sightseers gold star for scenic splendour. It’s just one of the places you will want to come back to, and many do. Long Reef is a joy to explore with its dunes, woodland and heath. For most people it is the fantastic coastal scenery that catches the eye along with the wildlife including sea eagles, kestrels and lizards. Bondi is renowned as the Australian iconic ‘People’s Beach’ but Palm Beach, well supported by the rest of the Northern Beaches, are the real jewels in the sandy crown. Palm Beach is ranked 8 in the list of the top things to do in Sydney. ‘Summer Bay’ or God’s Country? The grassy dunes and yellow sands of Palm Beach may look a little familiar. Palm Beach is the fictional neighbourhood of ‘Summer Bay’, from the Australian soap ‘Home and Away‘. Filming often takes place at the Surf Life Saving Club, and on the sands of Palm Beach. If you are feeling up to it, you can climb the trail to Barrenjoey Lighthouse for spectacular views of Ku-ring-gai Chase National Park and the coast north of Sydney. The Bible Garden is a secret little place most locals don’t know about. The view is simply breathtaking. The Palm Beach Bible Garden was designed and laid out with reference to the plants in the Old and New Testaments. Of the 148 plants mentioned, it is believed 143 have been planted in the Bible Garden in the order in which they are referred to in the Bible.